My day did not start well today. Having leaped joyfully from my bed feeling wonderfully refreshed I skipped happily downstairs (*obviously none of that is true – I was woken in a state of lowering fury by the feeling of an irritatingly cheerful purring visage poking into my face as the corresponding stripy bottom sat - horrifically - on my ear). Having headed downstairs intending to scrub my ear with a wire brush and Lysol I noticed a tomato stalk on the kitchen floor. Ignoring it with my customary attention to housewifely matters I staggered toward the bathroom, but then, my blood froze in my veins as the “tomato stalk” moved. The noise which erupted from the depths of my being was somewhere between a cat being flattened by a rolling pin and a heron being pulled backwards through one of those brush thingies you clean your boots on - “and out of the depths I cry to you O LORD!” It was a pretty big spider in my opinion. It ran over to a cat who helpfully and compassionately glanced at it briefly while continuing to inhale its breakfast. Then the wretched thing ran under the stove and hid (that’s the spider – not the cat). I pondered the options. 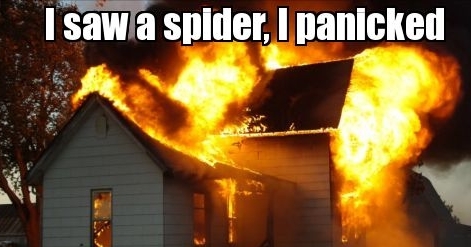 I could take the easy route – fetch the flame thrower, burn the house down and start life afresh somewhere else. Or simplify matters further by simply sealing off the kitchen permanently. Or I could just wear a hazmat suit forever. But no! I am a grown up woman, I have survived cancer, had three children and even packed up and moved to a new country without ever having seen the place. I am a warrior! And I will not be intimidated in my own home. Taking my courage in my hands I stepped slowly into position … and screamed up the stairs to my husband before bursting into tears and climbing up onto a chair (as if spiders can’t climb). This ridiculous phobia is a cause of shame to myself and my family. There are several embarrassing stories brought out of storage every once in a while, usually starting with the phrase “remember that time when mum …” A particular favourite is the occasion when I had to drive home a couple of blocks in the full knowledge that there was a spider on my dashboard. My daughter had already abandoned ship as soon as we noticed it but gleefully told me she had heard my unbroken wailing for the rest of my journey. Honestly – I wish I could produce that kind of breath control at will, it would be very useful for singing, scuba diving or for use as a nautical warning on foggy nights. Chris – apparently without fully awakening – flomped down the stairs, moved the stove and exorcised the evil intruder. The noise he made was somewhere between a dying whale singing through a tuba and the dropping of a crate containing loosely packed cymbals. He gave me a single look worthy of Medusa herself before retreating back to bed. To the casual observer this would have a fairly lame interaction all round but to me it was the heroic rescue from mortal danger by the dragon slaying knight of old. God is present in the most unlikely places and today he was present in a grumpy, semi -conscious, middle aged man in his undergarments.